There are some trekking companies in Nepal, especially at the budget end of the scale, who simply don’t look after the porters they hire. Osho Adventure is NOT ONE OF THEM! In fact, all of our Nepali porter are paid well, insured and taken care of. It is a common profession especially among the Sherpa people to work as a porter and carry a large pack such as food, fuel and tents on your behalf . They are used to the conditions in the mountains and can take big loads on their back. The weight is actually on their heads. Porters often come from the lowland valleys, are poor and poorly educated, and are sometimes unaware of the potential dangers of the areas they are being employed to work in. Stories abound of porters being left to fend for themselves, wearing thin cotton clothes and sandals when traversing high mountain passes in blizzard conditions. It’s true that many porters die or are injured each year and it’s important that you don’t contribute to the problem. Every porter or guide we hired at Osho Adventure are properly insured, this means we naturally pocket a percentage of the fee to them. There is a distinct difference between a guide and a porter. 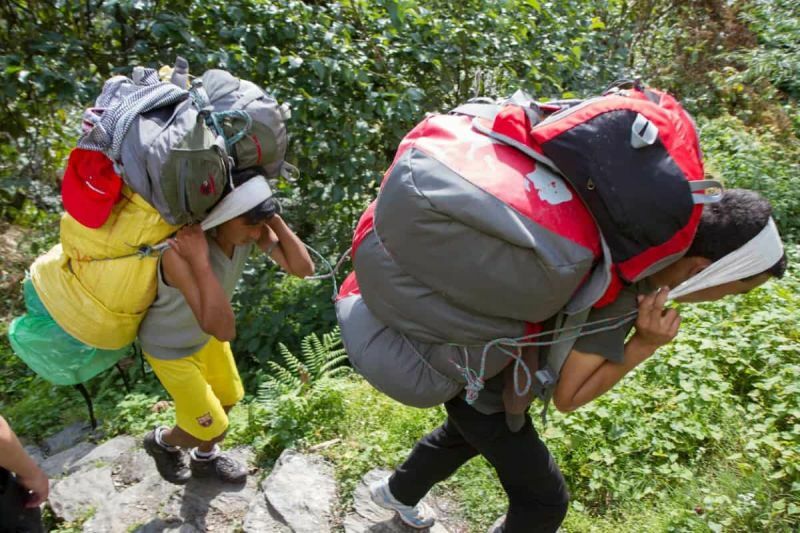 A guide should speak English, know the terrain and the trails, and supervise porters, but probably won’t carry a load or do menial tasks such as cooking or putting up tents. Porters are generally only hired for load-carrying, although an increasing number speak some English and know the trails well enough to act as porter-guides. Ensure that adequate clothing is provided for them. Clothing needs to be suitable for the altitudes you intend to trek to and should protect against bad weather. Equipment included adequate footwear, headwear, gloves, windproof jacket, trousers and sunglasses are provided. Ensure that whatever provision you have made for yourself for emergency medical treatment is available to porters working for you. Ensure that porters who fall ill are not simply paid off and left to fend for themselves (sadly it happens!). Ensure that porters who fall ill, and are taken down and out in order to access medical treatment, are accompanied by someone who speaks the porter’s language and also understands the medical problem. It’s common practice to offer your guide and porter a decent tip at the end of the trek for a job well done. Figure on about one day’s wages per week, or about 10% to 15% of the total fee. We recommend you always give the tip directly to your porters. Lastly, If you’ve got gear left over at the end of your trek, consider donating it at the clothing bank in Lukla (it is well signed and just off the main drag in Lukla or simply ask your guide about it). Prev PostHow to Stay Safe when snowstorm strikes? Next PostWhat is Tihar / Diwali Celebration in Nepal?